For the last decade or so, biopharma has been an isolated island within the startup ecosystem: you're either a biopharma specialist, or you don't touch it. Over the last few years, the biopharma specialists have been riding one of the biggest waves in startup-land. But if the rest of the startup world contributes its talents, the wave could turn into a tsunami. There is a ton of high quality science in academic institutions, a wave of significant advances in computing and analytics that could be applied to biopharma, and plenty of smart money waiting in the wings, but there is a significant shortage of talented entrepreneurs, engineers who understand biology, and seed-stage investors to put these pieces together and drive innovation to the market. For a quick glimpse of the magnitude of the current biopharma wave: in the first four days of 2018, biopharma startups have raised $966M in 16 deals, including $673M in 9 Series A deals. Compare that to the $1.9B that AR/VR startups raised in all of 2016 1. This biopharma wave has thus far largely been driven by changing industry dynamics and the ripening fruits of decades of scientific innovation, but new scientific advances and the cross-pollination of biopharma and tech promise to amplify this wave. providing many links to more in-depth articles for those who’d like to learn more. Directly address the common misconceptions about biotech investing, as others – most notably Bruce Booth of early-stage biotech specialist Atlas Ventures 4 – have done this well. Discuss the “digital health” world, as this world is very, very different than biopharma. Describe how one obtains sufficient domain expertise to get a job, start a company or invest in the space. Unfortunately, biopharma does not have the same vibrant system of online educational resources that tech does. I'm hoping to collect educational resources to help people get up to speed. If you know of high quality, accessible educational content related to biology, chemistry, business or drug development, let me know! If you are interested in creating educational content or mentoring scientists who are looking to break into the field, we'd love for you to participate in our program on life sciences entrepreneurship. 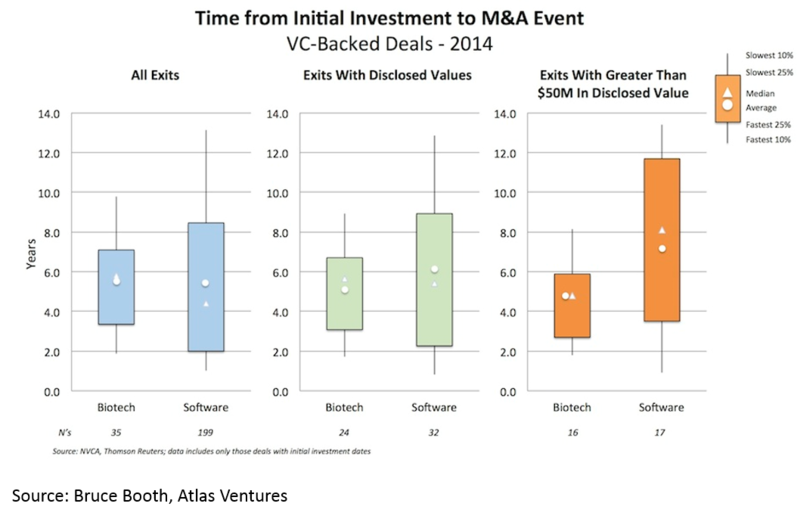 Since 2013, biopharma venture returns have exceeded those of tech / software, with more IPOs and M&A, higher exit values, and shorter time to exit. 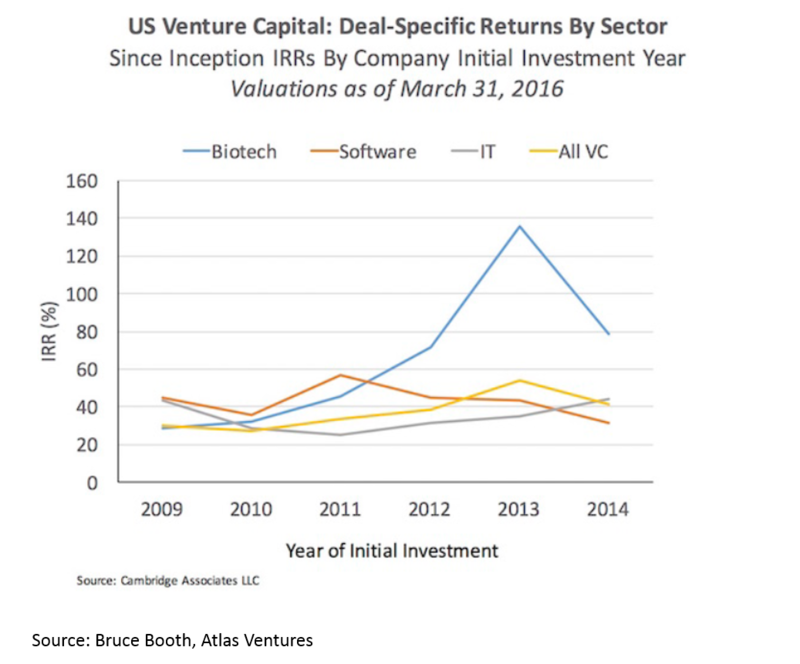 Venture investments in life sciences have doubled since 2010 to reach $15.1B in 2017. However, life science investments have not kept pace with tech investments: life science accounted for ~20% of all venture investing in 2017, down from ~33% in 2010. Biopharma’s resurgence has been driven by industry dynamics that should persist for the foreseeable future. 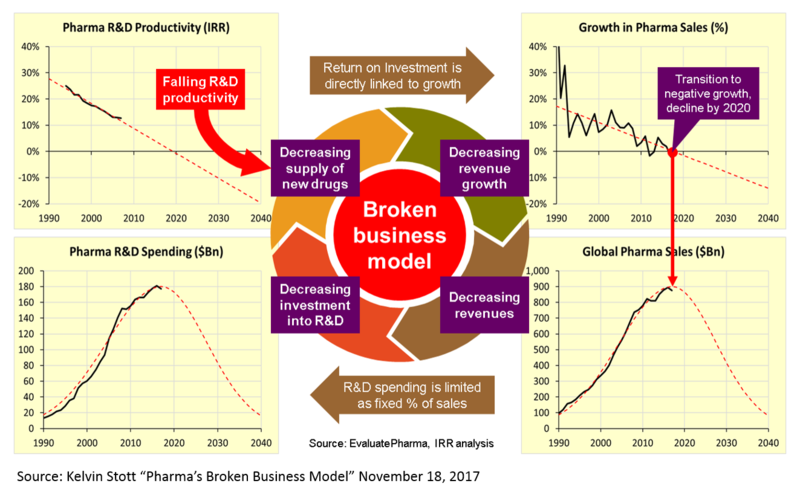 The productivity of big pharma’s traditional R&D model is declining, so they are increasingly buying external R&D to replace lost revenue and sustain growth. 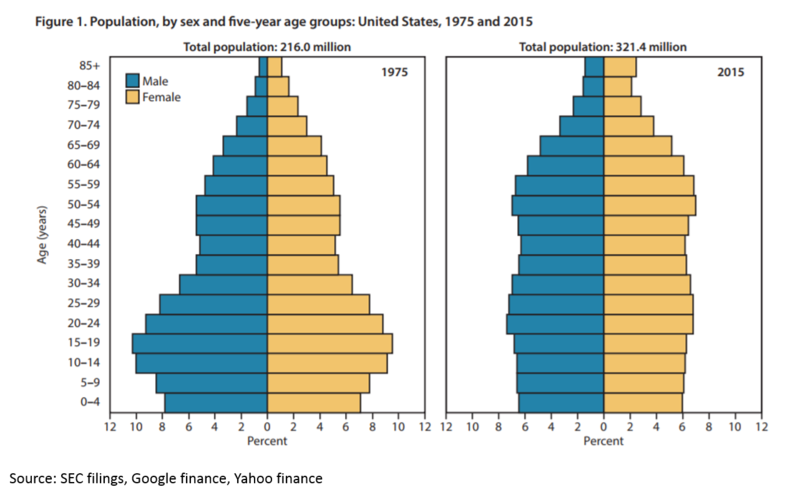 Demographic trends are creating huge, underserved markets for pharmaceuticals, including neurodegenerative disease like Alzheimer’s and Parkinson’s, addiction, aging, and psychiatric conditions. FDA has been supportive of innovation over the last few years, and the new FDA commissioner shows no signs of reversing this trend. 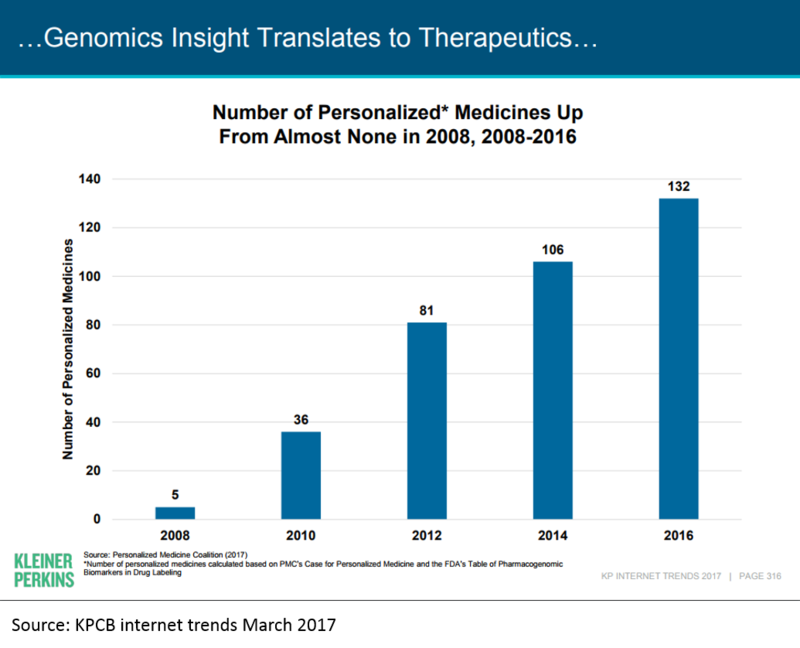 The technologies of the late 1990s genomics bubble are entering the "slope of enlightenment" phase and creating whole new classes of breakthrough drugs like personalized medicines, gene therapy, cell therapy, and electroceuticals. A new class of technologies, including CRISPR 5, bioinformatics, AI, and synthetic biology have the potential to unlock order-of-magnitude improvements in drug discovery and clinical benefit. While these innovations could start waves of their own, they provide "icing on the cake" at the very least. Although capital has flowed to the sector, the number of funded life sciences startups has not increased in 10 years, while the number of funded tech startups has tripled. Startups are increasingly involved in earlier-stage, innovative research (vs. reformulations or later-stage preclinical R&D). You don't have to be a molecular biology PhD to add value in biopharma. But if you are, you can add a tremendous amount of value. 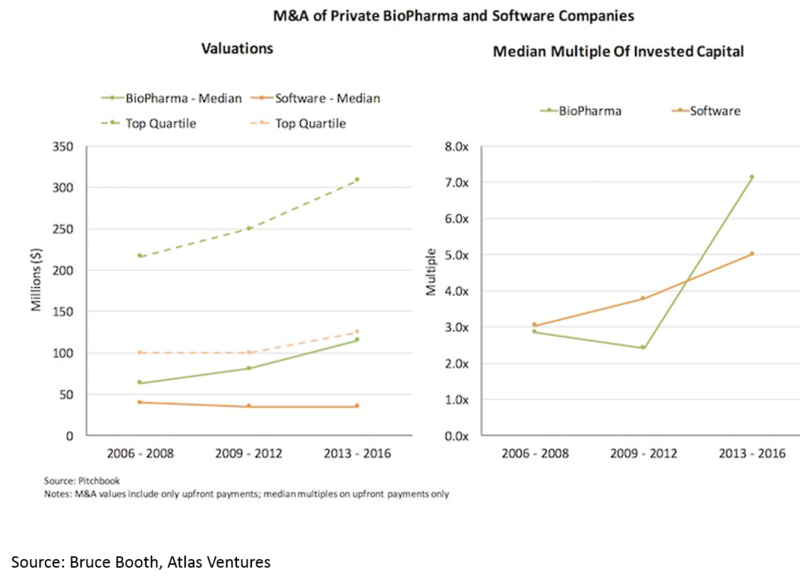 The difference between the last five years (2013-2018) in biopharma and the previous five years (2007-2012) is night and day. When I started working in biopharma venture in 2012, biopharma funds were closing in record numbers, generalist funds were shuttering their life science efforts, the concept of a preclinical biotech IPO was laughable, and big M&A deals were restricted to FDA-approved (or sometimes Phase 3) assets. From 2013 to now, all of those trends have reversed, and in a big way (with one exception: generalist funds still shy away from life sciences). 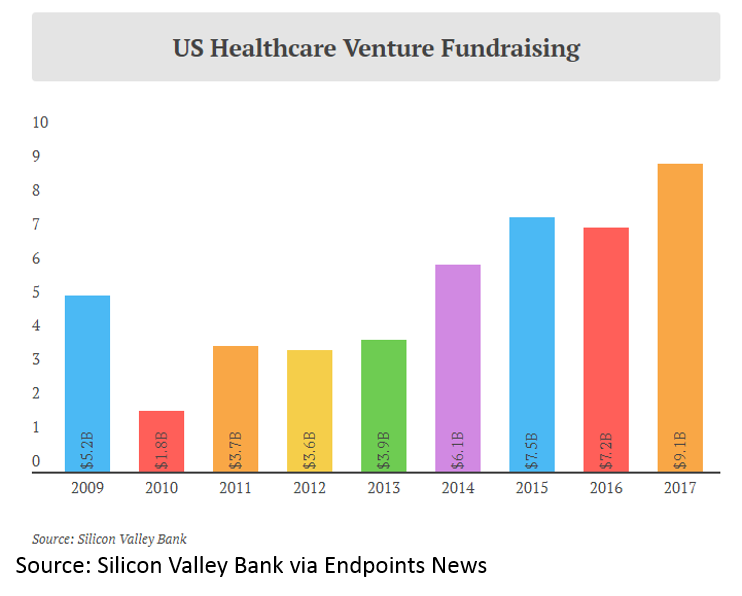 More on these trends after a few descriptive charts (these all either come from Silicon Valley Bank’s great report on “Trends in Healthcare Investments and Exits 2018” and various Bruce Booth posts). 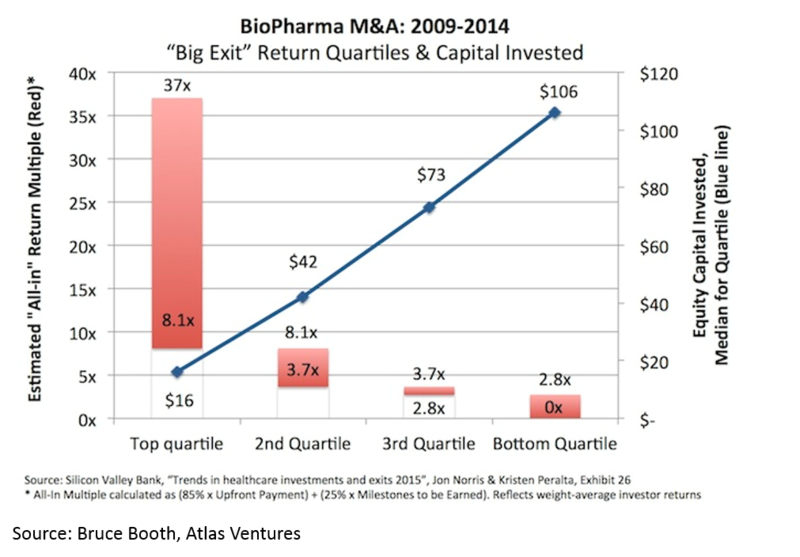 Returns in biopharma have outpaced the rest of the industry since 2012. This is despite strong returns in VC overall. The IPO market is also white-hot. Median IPO pre-money valuation was $295M in 2017. 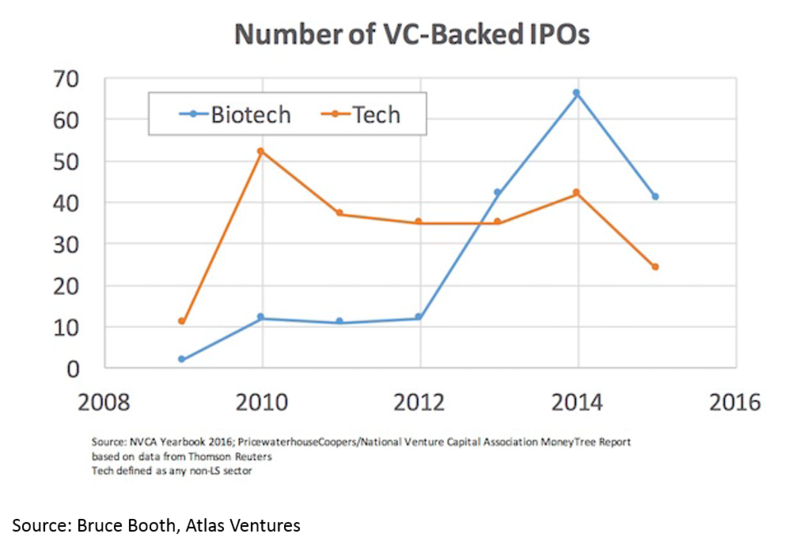 Since 2012, biopharma startups have had more IPOs than tech startups. 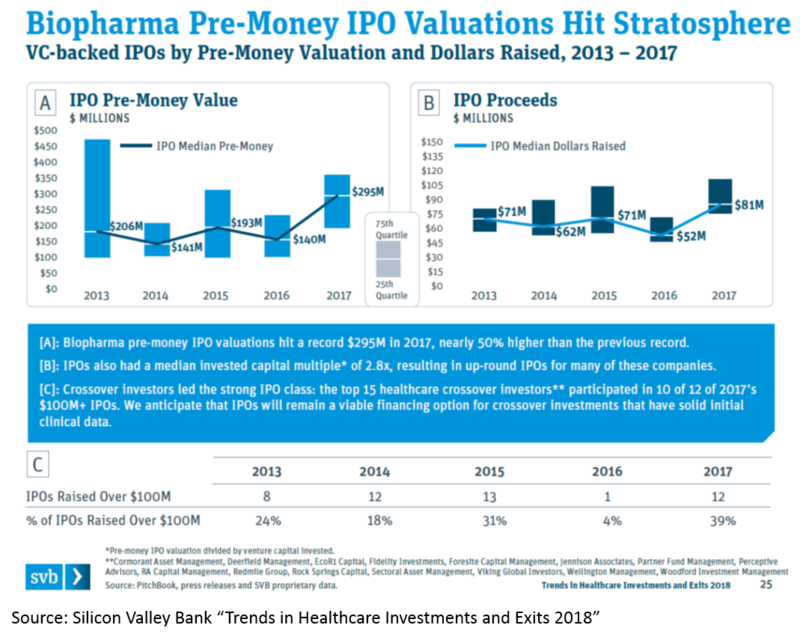 75% of biopharma IPOs were Phase 2 or earlier. 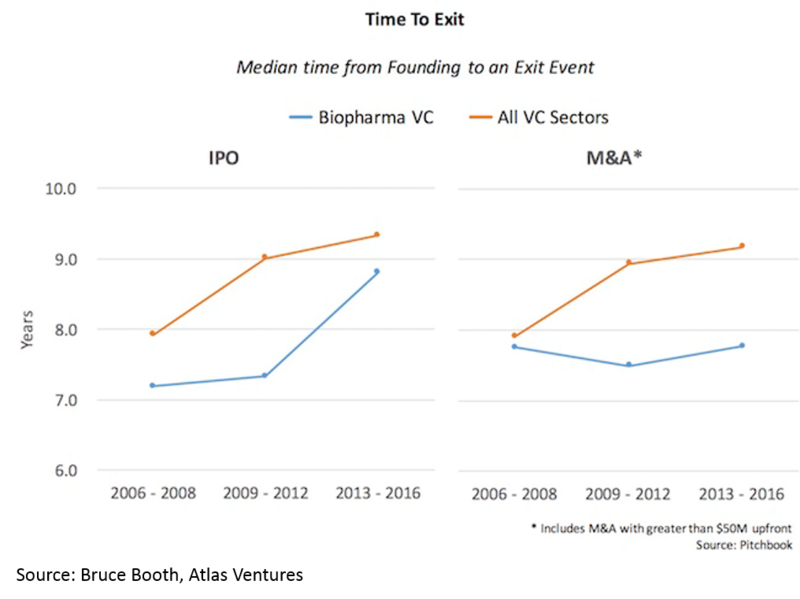 Time to exit (IPO and M&A) for biopharma startups is lower than for tech. When one considers that it takes roughly a decade and hundreds of millions of dollars to bring a drug to market, this “duration paradox” of early-stage biopharma investing is quite counterintuitive. However, it is real, and reflects the strong appetite for good science at big pharma, and startups' savvy around how to get to exit-worthy proof-of-concept in a time- and capital-efficient manner. Another counter-intuitive feature of biopharma startups is that, when done right, biopharma startups can be incredibly capital-efficient. 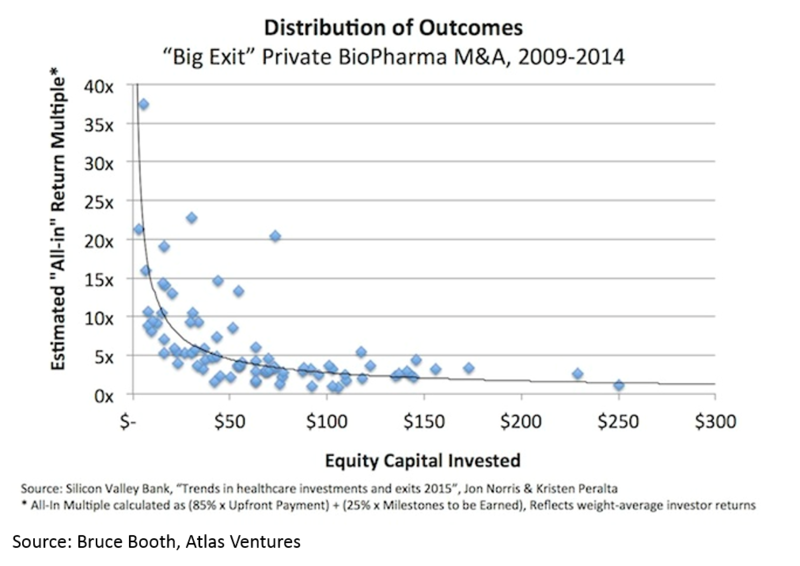 It is obvious that a lower denominator makes the exit proceeds / capital invested ratio higher, but the key point here (that is often misunderstood) is that you can have high value, capital efficient exits in biopharma. Despite the rising tide in the sector and the crowded public market and late-stage environment, there has been virtually no increase in number of funded startups or number of early-stage funds. Entrepreneurs have flocked in droves to blockchain, AR/VR, AI, etc, but have not touched biopharma. High quality deals have become so competitive that most early-stage VCs are starting companies in-house rather than fighting for the handful of startups with tier-one teams and tier-one science. Why are there not more biopharma startups? I don’t have a great answer to this. Part of the reason is likely that people aren’t really aware of the opportunity in the sector, or have misconceptions about the challenges in biopharma, or are intimidated by the science. 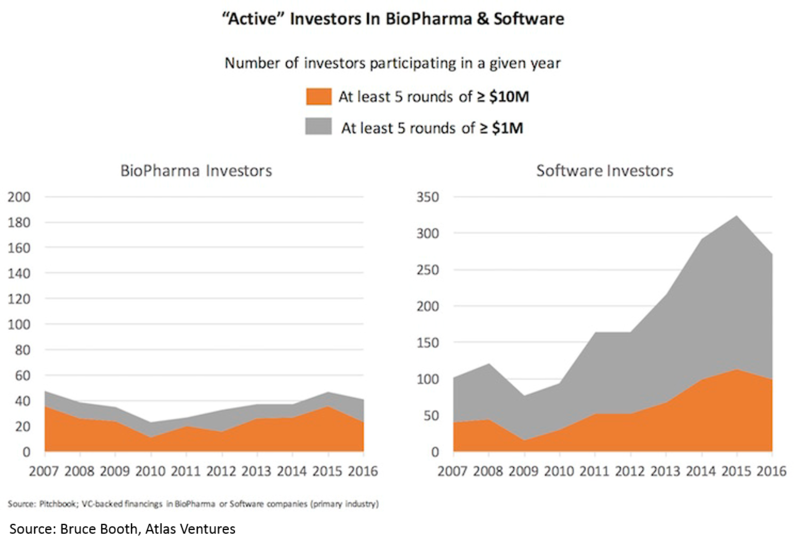 Part of the reason may be that there isn’t a robust seed environment in biopharma: most startups are formed in-house at venture funds by experienced serial entrepreneurs, and if you’re on the outside, it is very hard to raise funds. I’ll touch on this again later, but first, I’ll elaborate on why the above trends are happening. 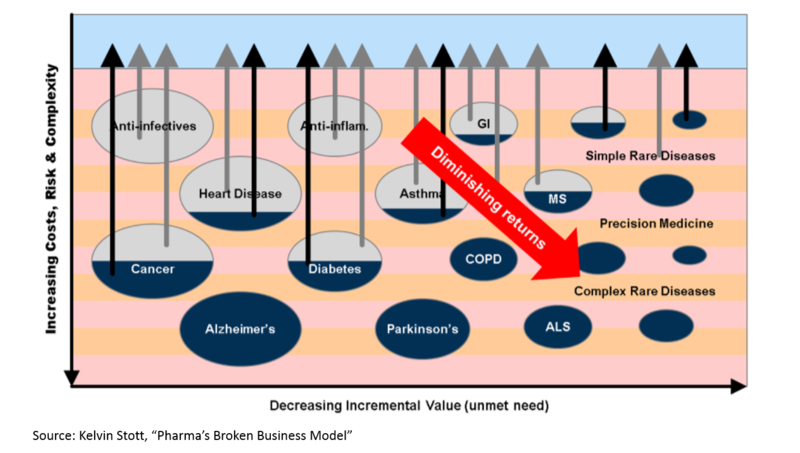 There are several posts in various parts of the internet describing various pieces of the current opportunity in biopharma, but I have not seen one that 1) synthesizes the industry-specific factors, the scientific innovation factors (starting on slide 301), and the tech innovation factors into one coherent picture and 2) explains the opportunity in a way that’s hopefully understandable to people who aren’t familiar with biopharma. I'll attempt to do so here; please let me know of any questions, comments or suggestions! 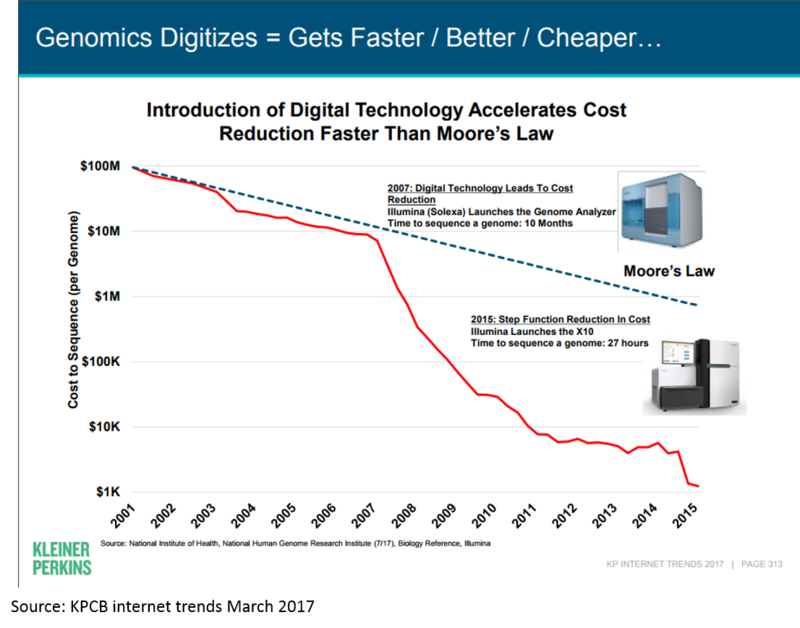 There is a concept in pharma called “Eroom’s Law” (yes, this is “Moore’s Law” backwards). 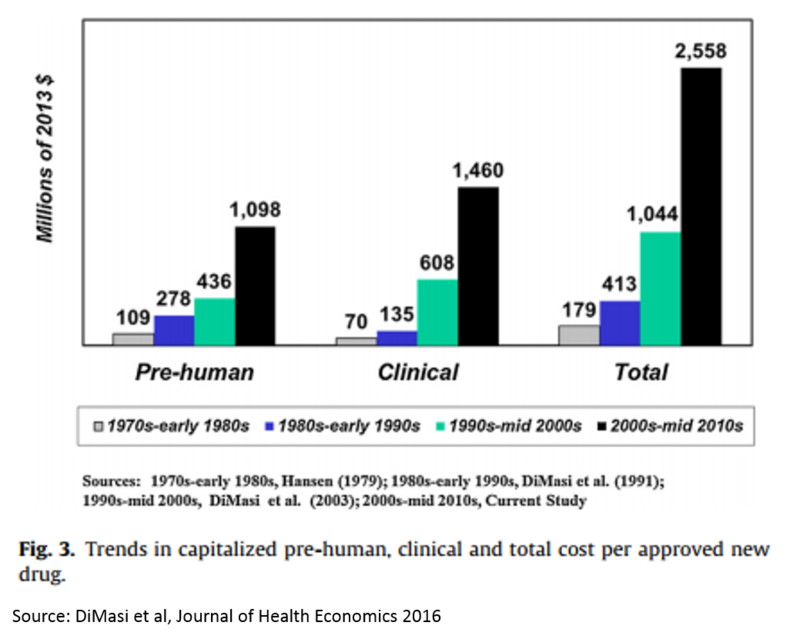 The concept states that the cost of drug R&D is increasing exponentially over time, despite important scientific breakthroughs. The reasons for this are many and mysterious, but Kelvin Stott, an R&D manager at big pharma company Novartis, laid out some of the leading candidate explanations in an amazing post last November (one that went about as viral as big pharma blog posts get). I won't rehash his arguments here, but I will present on one his charts that captures the vicious cycle that this drop in R&D productivity has led to. 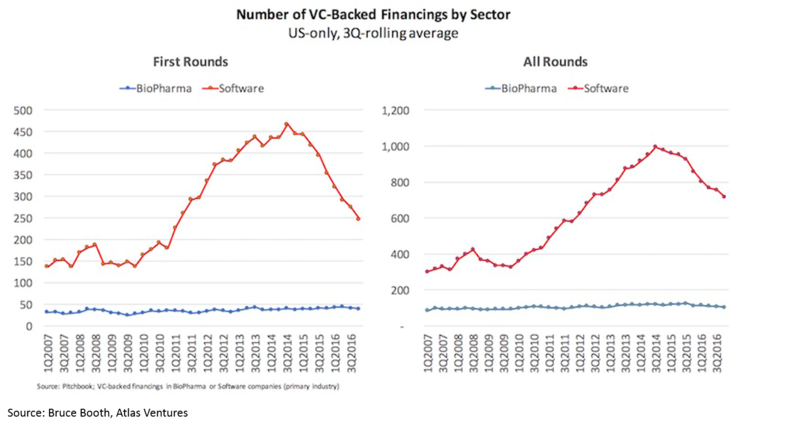 These charts present a rather dour picture, and one might reasonably ask how someone can make a case that biopharma is experiencing an R&D renaissance when looking at these numbers. But is important to note that this data measures R&D costs and productivity at big pharma – not at startups. The "Eroom's Law" chart above is based on data from 10 pharma companies, 5 of which are top 10 pharma companies (by annual revenue), 7 are top 25, and 3 are outside the top 25. I don’t have data for the cost and productivity of R&D at startups, so all I can offer is the conventional wisdom that startups are better at innovation than big pharma (if anyone has good data on R&D productivity at startups, I’d love to see it). 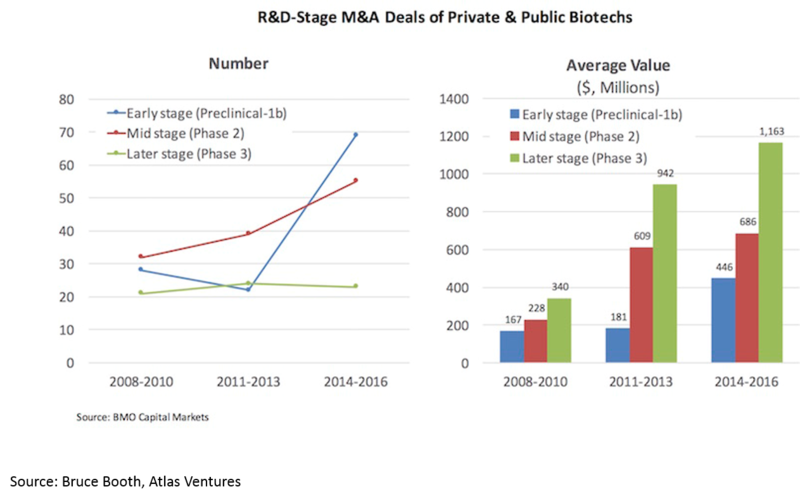 Based on the M&A data presented above, pharma seems to be putting its money on startup R&D. The failure of big pharma’s R&D engine is exacerbated when one considers the hit-driven nature of the pharma industry. Drugs have patents, and when those patents expire, revenues go from billions to zero overnight. 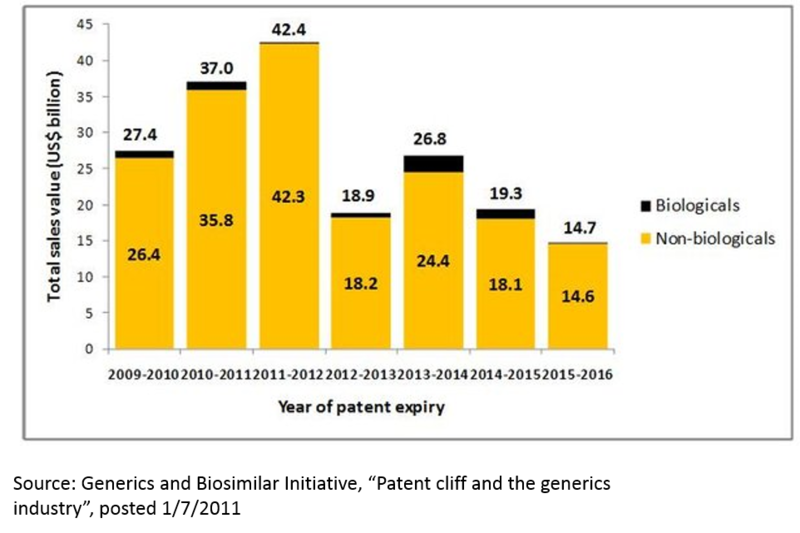 Around 2010-2012, there was a huge wave of patent expiries that saw many multi-billion dollar drugs go to zero. This phenomenon, called the “patent cliff”, resulted in the pharma industry’s revenue declining for the first time ever. This phenomenon is not over. In addition to patent expiries for traditional small molecule drugs, “biosimilars” threaten to erode revenues of several blockbuster drugs. Further, competition in the industry is as intense as ever, and competition can erode revenue even for drugs that still have patent protection. Pharma is incredibly vulnerable to these threats because revenue at large pharma companies is highly concentrated: in 2016, 15 drugs generated 20% of “big pharma” sales. A single drug accounts for over 60% of revenue at three large biotech companies, Gilead’s hepatitis C franchise generates 50% of its sales; even Roche, a top-4 big pharma by revenue, profit and market cap, generates 54% of its pharma revenue from just three products (when Roche’s non-pharma revenue is included, its top three drugs account for 41% of revenue). The first takeaway from the above chart is that revenue is highly concentrated. 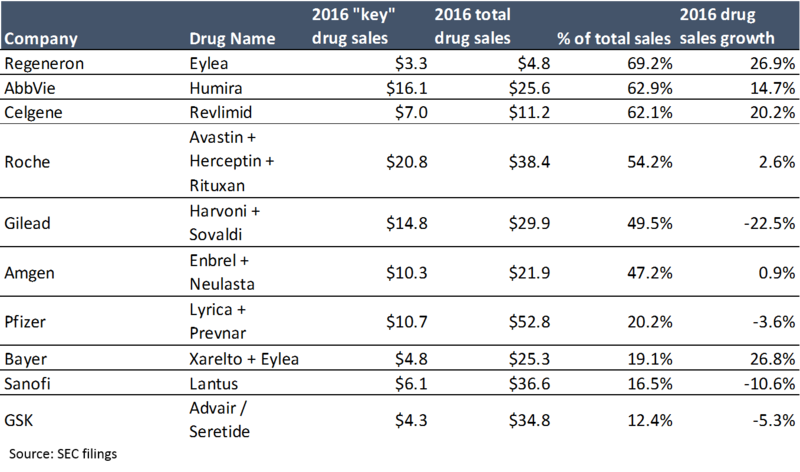 The second takeaway is that a blockbuster drug can make a LOT of money (at 95%+ gross margins). When you have products that can generate $5B+ a year at 95% gross margins, the massive prices big pharma is paying for startups make more sense. People thought Gilead was crazy when it paid $11B for Pharmasset and its not-even-FDA-approved hepatitis C drug in 2011, until that drug generated $2.3B in sales – in the first quarter it was launched (Gilead’s hepatitis C drugs generated $19B in sales in 2015, their second year on the market). If Snapchat was a drug, it would barely crack the top 100 by sales (and that’s just based on 2014 drug sales). Of course, supporting this profitability requires high prices. Pricing has been a huge topic of discussion lately, and rightly so. While a discussion of pricing is out of scope for this post, it is a critical issue, and I'll write about it in a future post. The point here is that pharma can afford to continue to fund R&D with its balance sheet for a long time. 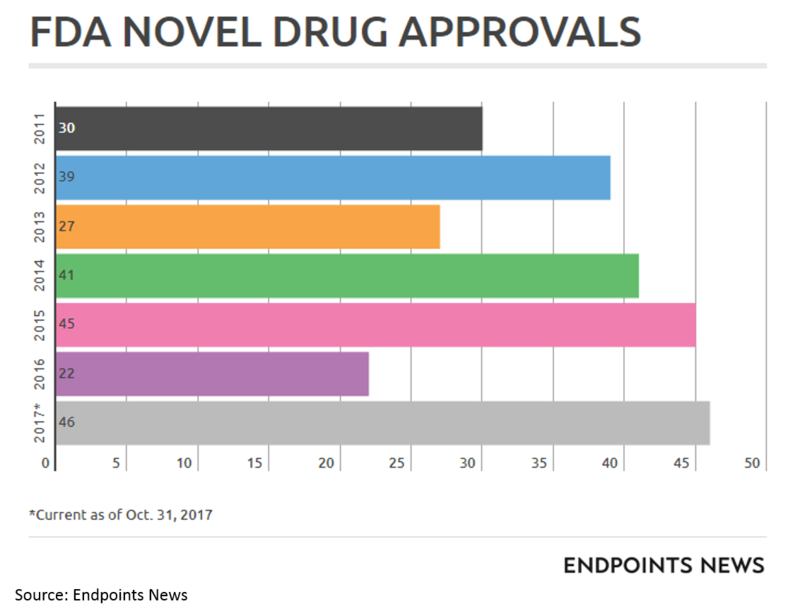 I should also note that a more favorable FDA environment has played no small part in the biopharma wave. While the new FDA chairman is viewed as quite innovation-friendly, it is impossible to predict what the FDA will do over any time period. FDA has been particularly helpful for drugs treating severe rare diseases and cancer through programs like Breakthrough Designation, Fast Track Designation, Priority Review and Accelerated Approval (and special programs for orphan drugs). There is a growing need for medicines to heal our aging population. But if you read Kelvin Stott’s article above, you might argue that the “low hanging fruit” of medicine has been harvested. The idea is this: in the mid-1900s, we were developing antibiotics that were curing fatal disease on a huge scale. We were eradicating polio. We were inventing insulin therapy. Then in the 1970s and 1980s, the biotech revolution unlocked a whole new class of potential drug therapies through genetic engineering. More recently, statins and drugs for heart disease have hugely improved health. But all those huge opportunities are in the past. Now we have to work harder to eke out marginal gains. Ok, it looks like Kelvin’s chart makes sense. 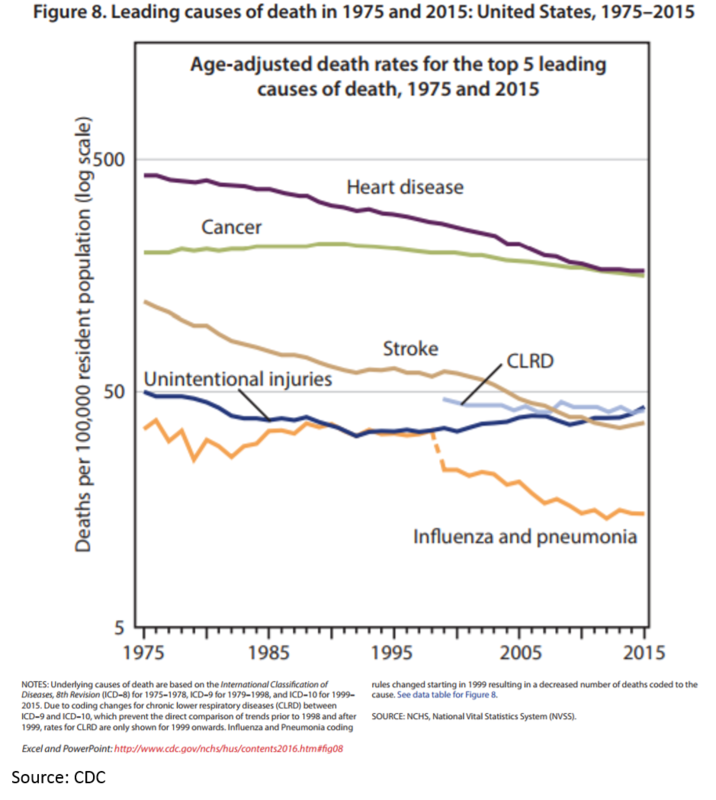 The death rates for heart disease, some infectious disease and stroke have dropped significantly. And pharmaceuticals have played a big part in this. Despite all of progress made, there is still obviously a huge unmet need. If the market for pharma companies is determined by the amount of disease that needs healing, that market is growing. So “suicide and poisoning” cause just as much loss of life as heart disease, 75% as much as cancer, and over 5x as much as diabetes, as measured by years of life lost before age 75 (cutting the data this way obviously does not include all of the years lost after 75; however, I did not see any data with a different age cutoff). But what does this have to do with pharma? 90% of suicides are driven by mental illness. There are more deaths in the U.S. due to mental illness-related suicide than breast cancer. And what’s this thing about “poison”? That’s the opioid / heroin crisis. 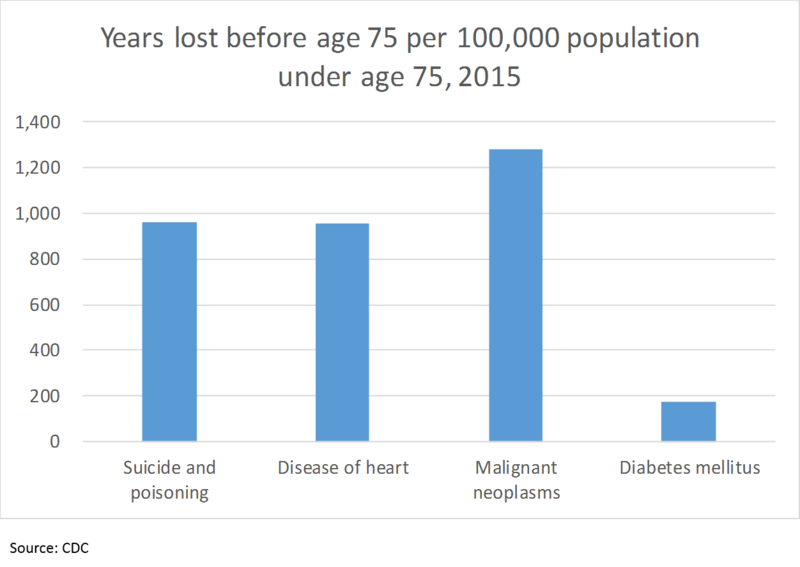 Alzheimer’s and Parkinson’s disease are also among the rising causes of mortality in modern society. In many ways, the brain is the next frontier of biology to unravel in order to improve human health. And with the aging population in many nations, longevity research is emerging as a fertile field for innovative companies. There is plenty of human suffering and disease left for biopharma companies to treat. They just aren’t good at treating this kind of suffering (Pfizer just axed its neuroscience division, replacing it with plans to launch a venture fund for neuroscience projects). But many startups are beginning to make some progress. Kelvin is right when he says a lot of the “low hanging fruit” for big pharma is gone. But the unmet need is larger than ever. This is why innovative startups are so valuable – the only way to make medicines to help more people is to expand the capabilities of pharmaceutical technology. The current biochemical toolkit has a ceiling, and to make a dent in the huge unmet need described above, we will need some new tools. First a bit of background for non-technical people like me: drug technology today essentially enables us to interact with one particular type of molecule at a time. We call this molecule a “target” – basically a molecule that plays a key role in an important disease process. It is very hard to find a “validated” target: for most diseases, there is a huge number of genes, proteins, cells, and biological pathways involved, and many of these are involved in normal bodily function as well as disease. Obviously all of this happens at a sub-microscopic level, so you can’t just look at what is happening, and this all happens in an incredibly complex, dynamic environment that we have no easy interface to interact with, so you can’t observe and interact with the human body the same way you can a computer. The simplistic models we use to explore biology often have only a distant relation to the actual biological functions they seek to model, so things that look like targets in a petri dish or a mouse often don’t translate to humans. Once you have a validated target, you have to create a drug that interacts with the target in the right way, often by blocking (“inhibiting”) it. This is also very hard, as we can only design drugs to interact with certain molecular structures, and if the target does not contain one of these molecular structures, we can’t interact with it. Even if we find a molecule that engages the target, we have to make sure that it doesn’t also engage other molecules in undesirable ways, or pose safety issues, and have to make sure it will get to the right place in the body, and that we are able to manufacture the drug consistently. And even if all of this looks good, the chance of it becoming an approved drug is only 10%. So why does all this matter? It matters because our current technology only allows us to skim the surface of pharmaceutical potential. With our current technology, we can only target 1-2% of the genes / proteins in our bodies (there are roughly 20,000 protein-coding genes, although there may be many varieties of each protein, but this is up for debate). 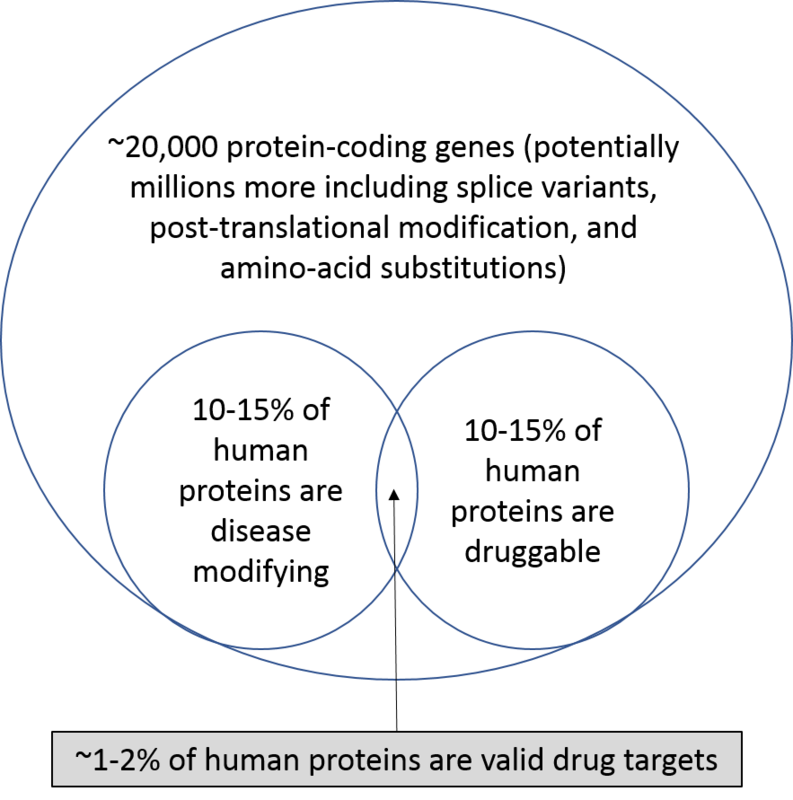 This is where new technology comes in: either increasing the number of proteins that are druggable, or uncovering new disease-related targets and pathways. Enlightened innovation refers to technologies on the “slope of enlightenment”. These are technologies are starting to realize their game-changing potential, although in many cases it has taken decades to start delivering on their promise. These innovations emerged as “radical innovations” years ago, but were too early to catch on. Over the years researchers have worked out the kinks, and these technologies are now market-ready. These technologies include gene therapy, cell therapy, and personalized / genomic medicine. These technologies are being embraced by life sciences entrepreneurs and investors. Radical innovation refers to new innovations with game-changing potential. The bounds of possibility for these technologies have not been established yet; they can either revolutionize the industry, or prove to be too early to make an impact. Examples include AI-driven drug discovery, synthetic biology, and new tools to measure brain activity. These technologies are not yet embraced by traditional biopharma entrepreneurs and investors, who are often more cautious around new technologies, but arguably have the most potential to revolutionize the industry. 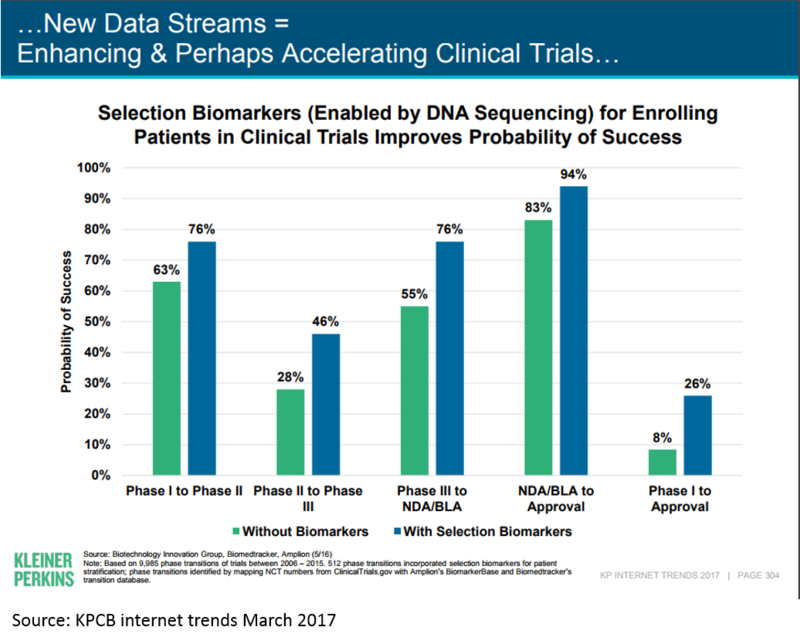 A full discussion of all the areas of innovation is beyond the scope of this post, but I'll illustrate the impact some of the "enlightened innovations" are having on biopharma today using the example of genomic / personalized medicine. The first human genome was sequenced in 2001. A "genomics bubble" soon followed, and then popped. But in the last decade, genomic medicine has begun to bear fruit. This is just an example of the real innovation that is driving the current biopharma wave; there are many more. And there is still massive innovation happening using traditional drug development paradigms; much of the immuno-oncology revolution has been driven by these types of innovations. Hopefully, the above information makes clear the opportunity in biopharma. I have focused on the economic aspects of the industry in this post both because I have an economics background, and also because in my conversations with people outside of the industry, the biggest misconceptions are around the economic opportunities in the industry. But economics alone are not enough to make biopharma a sector you should consider. The most rewarding part of working in biopharma for me has been the ability to constantly learn new things, to work with incredibly smart people who really care about helping others, and the opportunity to chart my own course (the advantage of the lack of structure in the biopharma career journey is that you are free to make your own path). But wait – don’t you have to be a scientist or a doctor to work in biopharma? The life sciences space NEEDS talented non-scientists: there is so much incredible science that will never reach patients simply because there are not enough businesspeople, engineers, entrepreneurs and financiers to identify and support talented scientists and move science forward. There are billions of dollars sitting on the sidelines, waiting for talented entrepreneurs to put that money to good use. And there are thousands of brilliant scientists who would love a chance to bring their science from the lab to patients, but who cannot accomplish this without the help of motivated entrepreneurs and investors. I do not have a science background, but stumbled into biopharma at the beginning of my career and have never looked back. I’ve worked in venture, at startups (as a co-founder, first employee and consultant), in investment banking, and with Google – all in life sciences – and have loved every minute of it. I’ve never touched a pipette and haven’t taken a science class since high school, but have found that with hard work, curiosity, and a willingness to ask questions that everyone else knows the answer to, there is an incredible amount of opportunity for personal and professional growth in this sector. And despite what you may hear in the media, the industry is full of people who care about alleviating human suffering and would love more help in reaching this goal. If you are interested in learning more about opportunities in biopharma, don’t hesitate to reach out. I manage a program connecting PhD students, postdocs and aspiring entrepreneurs with leading Bay Area life science VCs and entrepreneurs, and I am always looking to meet people with an interest in supporting the biopharma startup ecosystem. 1 Interestingly, AR/VR was cited as the number one most hyped sector by founders in First Round’s recent “State of Startups 2017” report. Life sciences was cited as the second-most underhyped sector (agtech was the most-underhyped). 2 The best reasons to work in biopharma are non-financial: you love science and can’t help but make a career out of it, or you have a loved one suffering from a disease and can’t help but try to cure it. I hope to find more eloquent guest writers to expound upon these topics in the future, but I majored in economics, so I frequently use an economic lens to try to understand things. I also think the financial / economic picture is the most misunderstood aspect of the industry for those who don’t work in it: people understand that if you like biology then biotech is a logical career for you, and if you want to improve the human condition then developing medicines is a viable way to do this, but fewer people realize that you can have a good career in biopharma as a non-scientist. 3 A quick note on terminology: I use “biopharma” specifically to refer to companies that develop FDA-regulated drugs intended to treat diseases (either large or small molecules, or newer tech like gene therapy). I sometimes use “biotech” as a synonym for “biopharma”, but in reality “biotech” means different things to different people, so I’ve decided to use “biopharma” to describe the sector of interest in this post. I generally use “biopharma” to refer to small, research-focused startups with no marketed products or revenue. I use “big pharma” loosely to refer to any profitable drug company that is more likely to buy a lot of companies than to be bought (organizations like Pfizer, Merck, Roche, Gilead, Novartis, Bristol-Myers, Amgen, Celgene, etc.). This is certainly not the strict definition of “big pharma” that people in the industry are familiar with, but it suits my purposes for this post. I use “life sciences” to refer to any company that diagnoses or treats disease using tools from biology or chemistry, including biopharma, medical devices, diagnostics, and any technology related to these fields (gene therapy, cell therapy, protein and small molecule drugs, genomics, bioinformatics, knee implants, surgical robots, etc). So using my definitions, all biopharma companies are life science companies, but not all life science companies are biopharma companies. 4 If you are interested in early-stage life sciences and don’t read Bruce Booth’s blog, you should. Atlas (where Bruce is a partner) is a top-tier early stage fund dedicated to therapeutics, and they wrote the blog on starting biotechs from scratch in-house at VC funds. Bruce is one of the few biotech VCs who blogs, but fortunately he is a great thinker and writer. Much of what I write will reference his posts and analyses. 5 I’m not sure that CRISPR belongs here, as it has already had an enormous impact on the research field, but its clinical applications are still early-stage. I also don’t think it fits into the “slope of enlightenment” bucket yet; there are approved gene therapies, cell therapies, and personalized medicines, but approved CRISPR therapies are still a long way out. 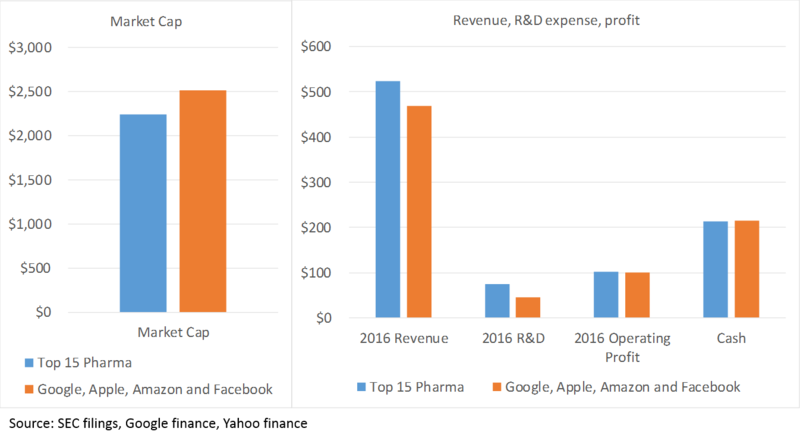 6 Admittedly, comparing 4 tech companies to the top-15 pharma companies is not a fair representation of the two sectors. My choice of Apple, Amazon, Google and Facebook was merely to find a group of tech companies that was similar to the top-15 pharma companies by market cap, in order to provide a reference for the value of the big pharma industry. 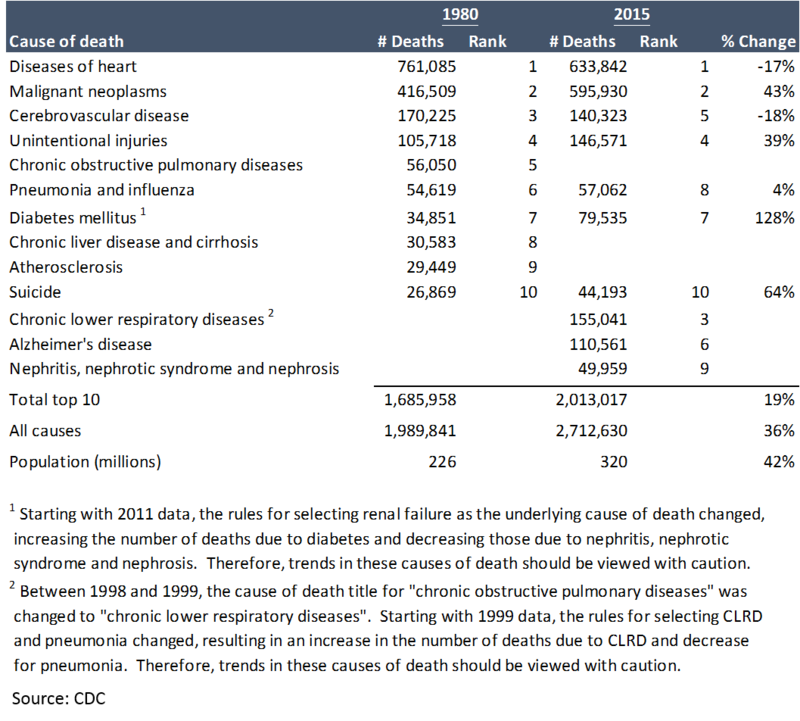 7 Most of the data in this section is from the CDC’s 2016 United States Health Chartbook. 8 Disclaimer: I am not a scientist.